Former Brigham resident Anne Sharpe, 50 is running Brigham 10K on Easter Sunday. 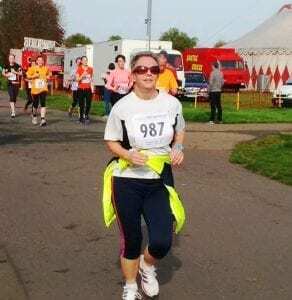 Anne has run many of the great national road races across the country but none as great as this run in memory of her mum, Joan Sharpe. Joan was one of the first fundraisers for Hospice at Home West Cumbria in the Cockermouth area. Joan and her husband David cycled from Land’s End to John O’Groats to raise money for the charity when it started in the late 1980’s. Joan’s involvement as a volunteer fundraiser continued for many years. As well as organising coffee mornings and managing the collection boxes in pubs and shops, Joan also started knitting the now hugely successful Easter Chicks, selling them from County Fruit Stores on Station Street Cockermouth to support the charity.